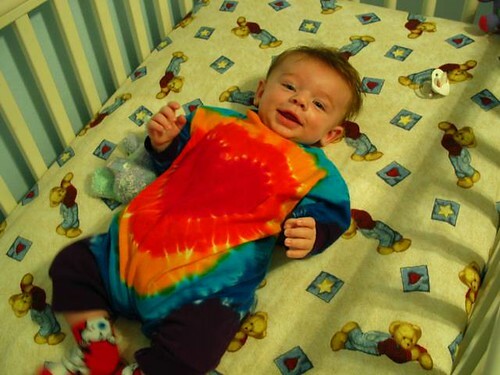 Simon looks cute in his tie-dye shirt. Thanks, Jessica! He likes playing in his crib, although we try to encourage him to try sleeping in it as well. He has been doing fairly well, recently, including an inexplicable 9-hour-in-a-row sleep night. We've discovered that he definitely sleeps better at night when he has slept more during the day. In fact, his tendency to sleep well at night before was probably caused by exhaustion from not sleeping during the day. What we found was, as he started to sleep better during the day as we controlled his acid reflux, he slept worse at night--and it was only when we were able to really get him to sleep A LOT in the day that he was able to really sleep well at night. Of course, he's still only approaching 4 months, and certainly could change at any moment still.